Why are ashes a symbol for the Lenten season? The purpose of symbols is to move our minds to think about the reality being represented. For instance, the waters of baptism call to mind the washing away of sin that occurs in this sacrament. When we fail to understand the meaning of a symbol, it becomes a meaningless gesture. To question the meaning of a symbol, then, is a good thing. It helps us understand what it means and how it is to move our minds and hearts. As we began the Lenten journey, our forehead is marked with the symbol of ashes. A bowl of ashes may be kept on display in a liturgical setting, or they may be represented on a banner for the Lenten season, or a picture of them may be on Lenten materials that we use. But why are these burnt remnants of palm branches such an apt symbol of the spirit of Lent? Exactly when ashes began to be used as a religious symbol is unknown. In early human religious practice, clay was smeared on the body of the deceased as a symbol of respect. This custom seemed to have emerged to the mourners to put some of the dust of the grave on them as a symbol of mourning and unity with the deceased. As religion continued to develop, the use of ashes evolved to not just be a symbol of sorrow and mortality, but also one of repentance. These themes run through the biblical use of ashes. In the Book of Esther, Mordecai put on sackcloth and ashes in sorrow at the plan to kill all of the Jewish people in the Persian Empire (Esther 4:1). Job, facing the many unfortunate situations he found himself in, repented of his sins in ashes (Job 42:6). Famously, Jonah traveled but a day in the great city of Ninevah before the king directed the whole town to repent in sackcloth and ashes in hopes that the Lord would not destroy the town (Jonah 3:5-6). Jesus, too, saw ashes a symbol of repentance, of turning away from sin to embrace the life of the Gospel. In frustration for the hardness of heart with which many met Him, Jesus stated that Tyre and Sidion would have repented in sackcloth and ashes at the works and words He was giving to the people (Matthew 11:2). In the early Church, when the practice of public penance was commonplace, priests would often sprinkle ashes on those who had come to the sacrament of reconciliation. By the eighth century, this practice would extend to the dying. A dying person would be laid on sackcloth and sprinkled with ashes and asked if they would accept these symbols of penance before their judgment. These same themes run though our use of ashes today. Ashes symbolize our sorrow for our sins and express our desire to change. They also remind us of our mortality, that we are but dust and one day we will return to that same dust from which we came. This column appeared in a previous edition of the Review. 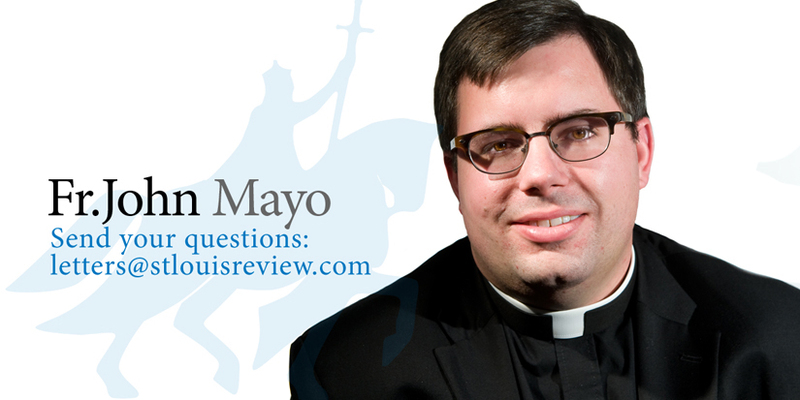 Father Mayo is pastor of St. Raphael the Archangel Parish in St. Louis.